To turn a ripe jalapeño into a chipotle is no little thing. A jalapeño grower harvests unripe green jalapeños multiple times during the growing season. The chilis still on the vine at the end of the season ripen and turn bright red. They are left on the bush as long as possible until they turn deep red and begin to dry out. These are the jalapeños that become chipotles. The picked red chilis are spread on metal grills and smoked for several days. They are stirred every few hours so that the wood smoke reaches into all the surfaces and crevices of the slowly wrinkling chilis. The end result is a blackish-purple chipotle. The adobo sauce in which chipotles are sometimes stewed not only blends well with the the rich flavours of roasted pumpkin and maple sugar, but also decorates the finished dish with a pretty deep red swirl of colour. Note: To print this recipe, or any other diplomatickitchen recipe, go to the bottom of the page, at the end of the post, and click on the icon: Print & PDF. You will have the option of printing in smaller text size and without photos. A Timing Note: Whipped Roasted Pumpkin, Adobo and Maple Spiced may be made a day in advance, cooled, covered and refrigerated. 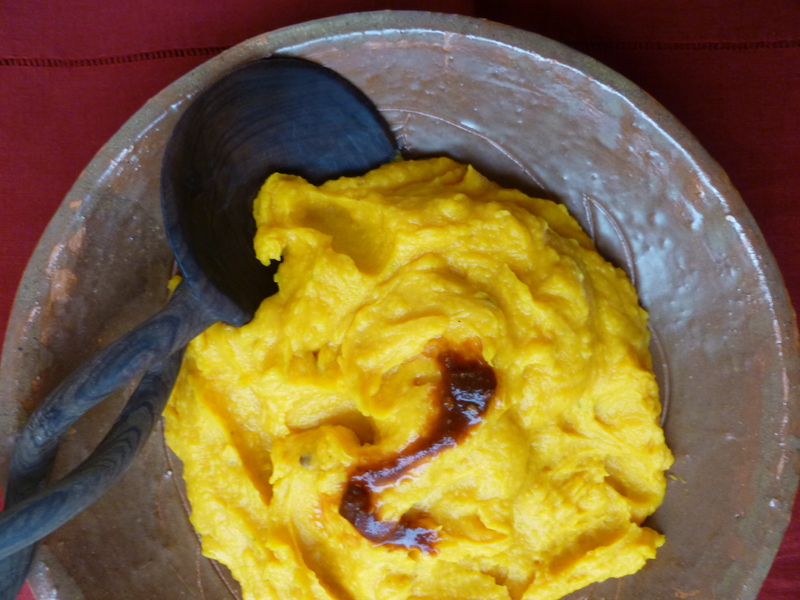 The recipe suggests thinning the pumpkin purée with vegetable bouillon if it is too thick after being mixed in the processor. If the recipe is made a day in advance, wait until the following day, when the purée is reheated, to adjust its thickness, season it with salt and pepper, or add a little more adobo if you’d like a more pronounced smokiness and heat in the dish. 1 cup of Vegetable Bouillon (made with 1/2 of a 10 gram vegetable bouillon cube and 1 cup of water): The bouillon is added as needed to thin the pumpkin purée. 2. Cut the pumpkin in half, from stem to base and scrape out the seeds and stringy centers with a spoon. Put both halves on the pan, cut sides down. Pour 1 cup of water around them and roast the pumpkin for about 40 minutes, or until it is tender. 3. Let the pumpkin cool a little. Remove the roasted flesh from the shells and put it in a bowl. Discard the shells. 4. 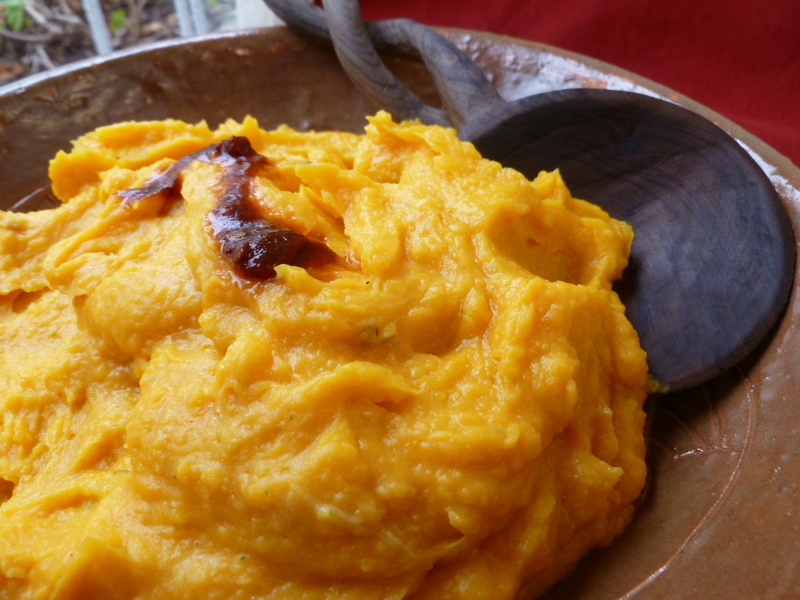 Add the butter, maple syrup and adobo sauce to the pumpkin and mash everything up together a little with a wooden spoon. 5. 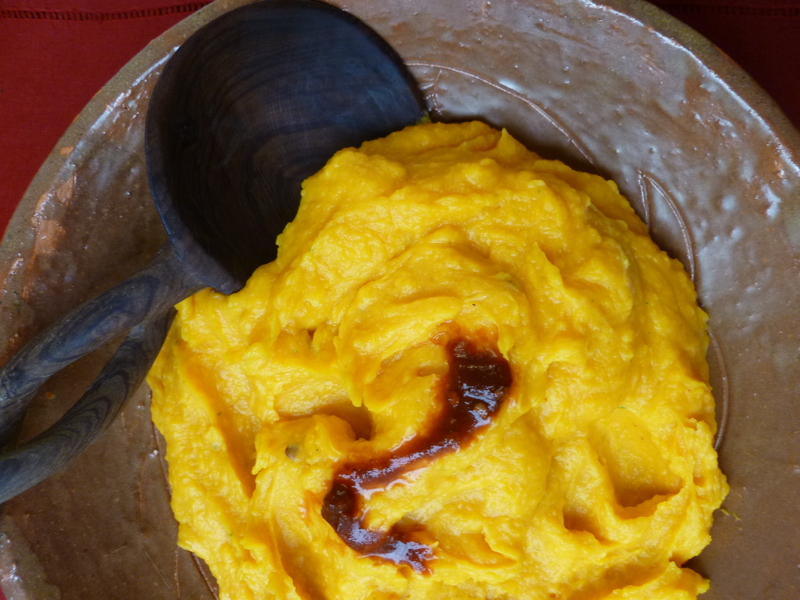 Purée the mixture in batches in a food processor or blender and transfer it to a heavy-bottomed pot or the bowl of the bain-marie for reheating. 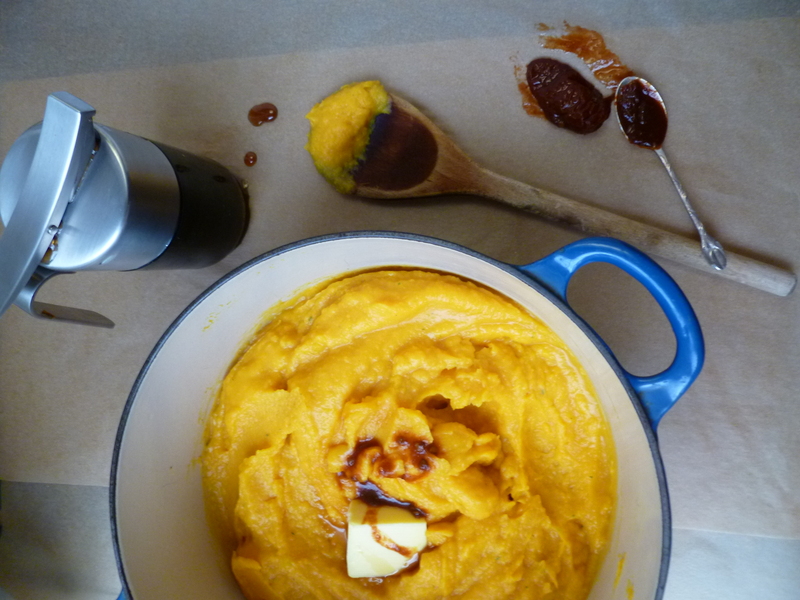 Thin the whipped pumpkin with some spoonfuls of vegetable bouillon if it is very thick. Add a few grinds of black pepper and salt. Warm the pumpkin and taste it. Adjust the seasoning to your liking, adding, besides salt and pepper, a little more adobo, if you want a smokier, hotter version. 6. An optional Last Touch is…a thin swirl of adobo on each serving. 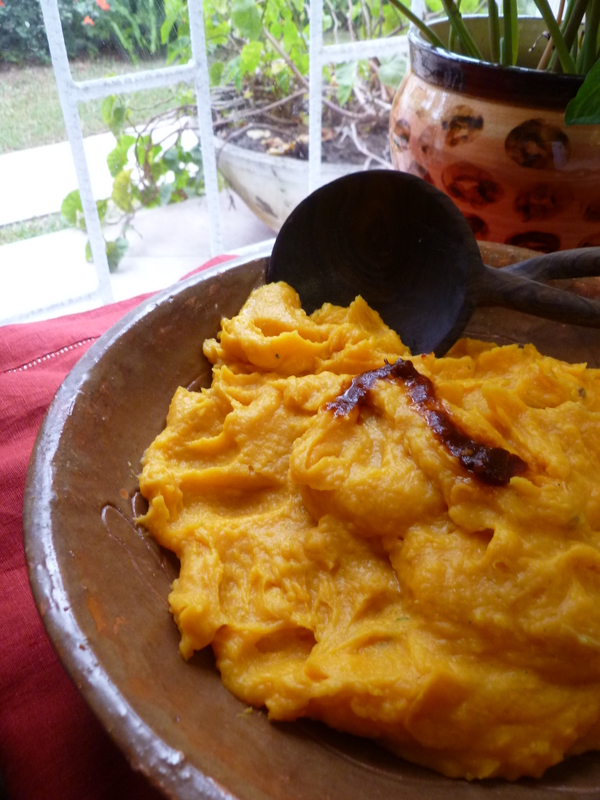 Note: Pumpkin, served in the form of Whipped Roasted Pumpkin, Adobo and Maple Spiced is, on occasion, a nice alternative to potatoes or rice. The diplomatickitchen lists this recipe under both the Potatoes/Pasta/Rice/Beans and the Vegetables categories. A Second Note: Whipped Roasted Pumpkin, Adobo and Maple Spiced is served alongside the Main Course of Salmon au Poivre in the Dinner Menu: Mixing Dinner and Business.